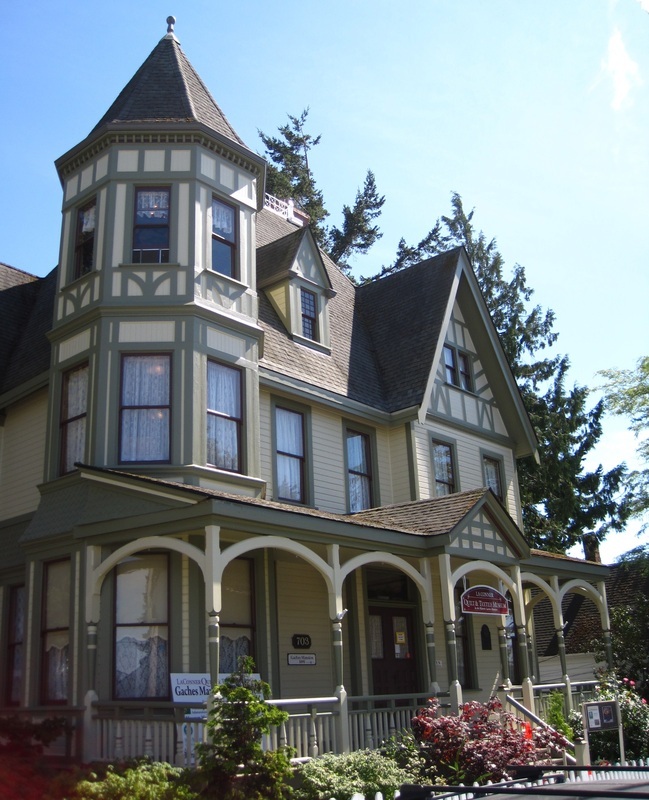 The Gaches Mansion, now home of the Pacific Northwest Quilt & Fiber Arts Museum, has had a long and fascinating history here in the Skagit Valley. The following information has been compiled both from Museum records and a research document written by Mrs. Roberta Nelson, which was printed in the Puget Sound Mail on May 30th of 1974. The Gaches brothers played a very important part in the development and history of La Conner. They were born in Peterborough, England, and were subjects of Queen Victoria of Great Britain. George arrived in La Conner in 1869—at the time, there was only one trading post established. George called on his brother James to join him from Australia (James had traveled to Sydney at age 14), and by 1873 they had established a successful mercantile business in La Conner. James and George purchased a piece of property from Mr. James A. Gilliland on July 20, 1875, for the sum of $125. The property was large enough for both brothers to build their homes, and both still stand today (James’ home is now a private residence, just across from La Conner’s City Hall and 1/2 block from the Gaches Mansion.) George built the Tudor-style Victorian mansion that would come to be known as the Gaches Castle, finished in 1891. The builder of the Gaches Mansion is thought to have been either Joseph F. Dwelly or F.N Wells. Built in the grand manner of English tradition, the Gaches Mansion reflected the fine English upbringing of George’s wife Louisa. The home included three main floors, a basement, an attic, and a “widow’s walk”. It featured over 20 rooms, including a magnificent entry, an extra large reception hall, a drawing room and parlor, a large living room, kitchen, pantry, a back porch, and even a servant’s staircase that still runs parallel to the main staircase. The house was warmed by three coal-burning fireplaces, each of which are still intact (although no longer used). The fireplaces are adorned with the original Italian-made ceramic tiles, and each set of tiles are different. Pocket doors and wood floors throughout the first floor are made of old-growth Douglas fir, as is the picture-rail and trim throughout. Louisa Wiggins Gaches decorated her grand home with furnishings from all parts of the world. These furnishings arrived in La Conner by coming “around the horn” by boat, and then by steamer to town. Louisa was active in church and civic affairs, and held many receptions and early-day parties at the Gaches Mansion. A La Conner man recalls in his diary that the Gaches hosted many New Year’s Eve parties in the Mansion, and another woman recalls that it was the first home in the area to have a “regular” bathtub. Most rooms in the upper floors were used as bedrooms, as the Gaches had a total of 7 children. Sadly, four of the Gaches children died in infancy and were laid to rest at nearby Pleasant Ridge Cemetery. The three surviving children were Hugh, Hilda and Will. The J & G Gaches Mercantile became increasingly successful, and George and Louisa eventually moved to Seattle. The Gaches Mansion stood vacant until it Dr. G. E. Howe began renting. 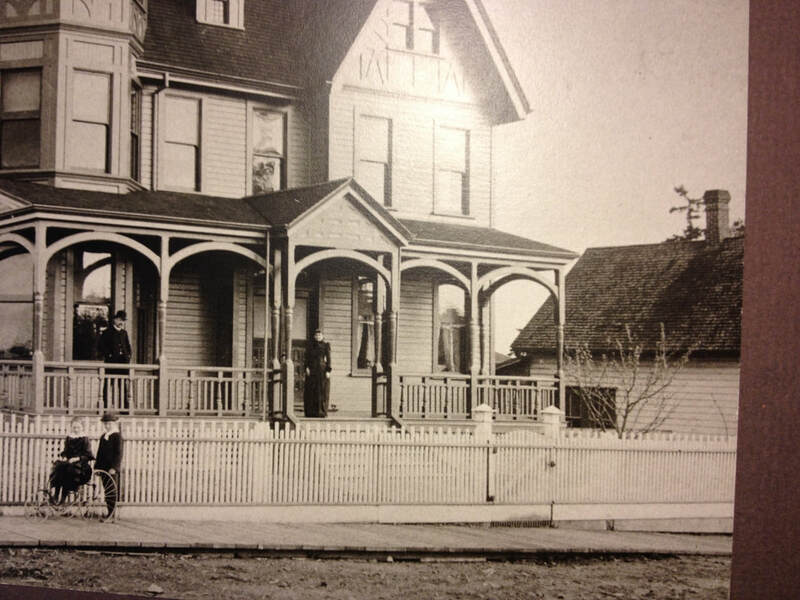 Dr. Howe purchased the Mansion on November 21, 1905, for $3,000 and it became Skagit County’s first hospital. Dr. Howe was remembered as a “well-liked bachelor” who provided much needed health care in the valley. Mr. Vaughn gave Mr. Samuel Pittinger a mortgage on the place in 1927, for a sum of $1,500. The Vaughans both died, and Mr. Pittinger suffered from significant health problems. Heirs of Pittinger sold the property to Louise Bettinger of La Conner for $1,000 in November 1940, and she promptly turned it into apartments. Throughout the next 30 years, the interior of the Gaches Mansion (referred to as the “Castle Apartments”) would see drastic changes. The floor plan was altered to accomodate many additional bathrooms and kitchenettes, and the grand staircase was removed and walled-in. Overmantles from the fireplaces were removed and sold, and many of the pocket doors were taken down and placed in the basement. The Castle Apartments were almost always rented. Gaches Mansion shortly after it was built. The historic 1891 Gaches Mansion, as it appears today. Photo by Alex Kramer. It was a Sunday in 1973 which changed the fate of the Gaches Mansion forever. A careless tenant left a cigarette burning, the third floor and attic were soon ablaze. Volunteer firefighters battled the flames into the morning hours, but there was little more than charred rafters left on the third floor and attic. Suffering from devastating water and fire damage, the Castle Apartments were left without a roof and open to the elements through the winter of 1973. While some believed the Mansion should be torn down due to increasing safety concerns (the critically damaged house was literally falling in on itself, and a brick chimney collapse worried many nearby residents), others saw the history of a La Conner landmark in jeapordy. Local resident, Glen Bartlett, called on fellow residents to discuss what might be done to save the Gaches Mansion, and the La Conner Landmarks group was born. Within a year, the Gaches Mansion had a new roof. 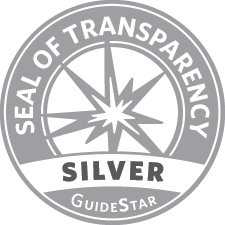 Over the next few years, the all-volunteer group would succeed in getting the Mansion listed on the National Register of Historic Places and secured a matching grant for critical repairs and restoration. 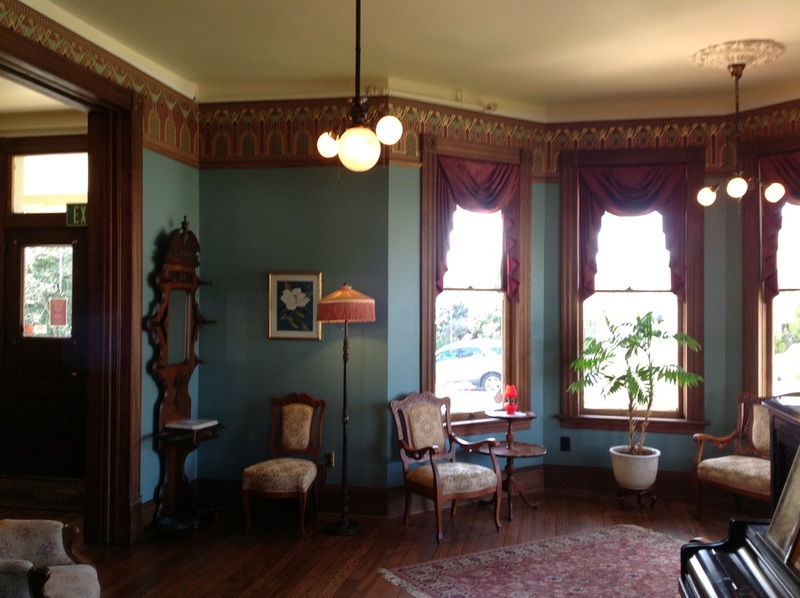 Within a few years, the Gaches Mansion was restored to its former glory and ready for a new purpose. 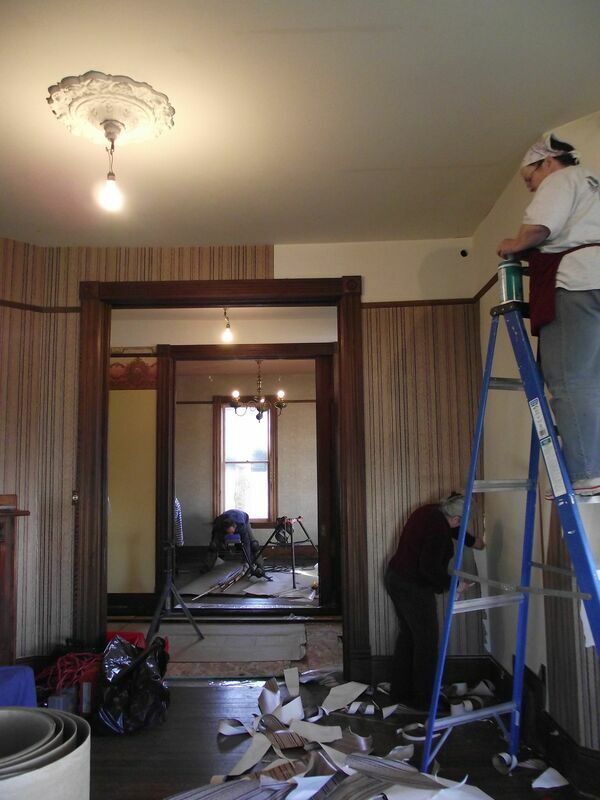 Donations of cash, skilled craftsman labor, furnishings, Victorian-era antiques, and decor, such as, wallpaper and drapes helped bring the Mansion back to life. In 1981, the Gaches Mansion was being used as the key viewing center for a growing collection of regional artwork. La Conner resident and photographer Art Hupy started the Valley Museum of Northwest Art on the Mansion’s second floor, and over the next 14 years this small and relatively informal gallery would grow to become the Museum of Northwest Art. Over the years, the Mansion housed a growing collection of works from artists like Guy Anderson, Mark Tobey, William Ivey, George Tsutakawa, Philip McCracken, and Mary Randlett. During this time, the La Conner Landmarks group sold the Mansion to the Town of La Conner for a menial sum, and the Museum of Northwest Art moved to a larger location on La Conner’s First Street. Now, thanks to a Washington State Heritage Capital Projects Fund (HCPF) grant administered by the Washington State Historical Society, a generous grant from the M.J. Murdock Charitable Trust, and contributions from our amazing supporters, we have completed a $450,000+ restoration project that has spanned almost 7 years. 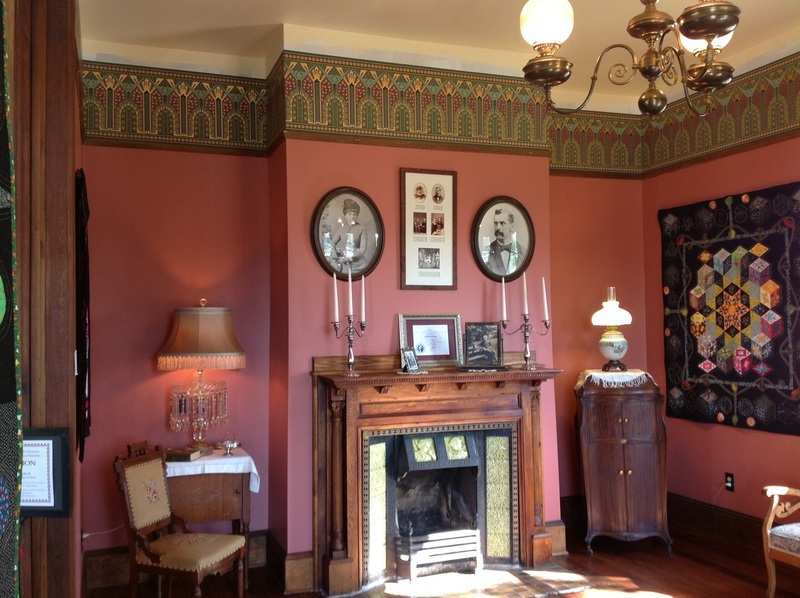 The 1891 Victorian Gaches Mansion is the crown jewel of La Conner’s Historic District. For a continuing history of how the museum (as it was known originally) came to be, see Museum History.